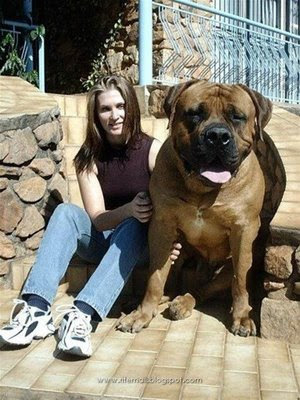 World's Biggest Dog - Is it Real?? 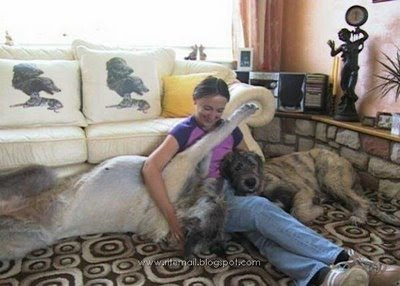 Home » Extreem Cases » Unique » Weird » World's Biggest Dog - Is it Real?? 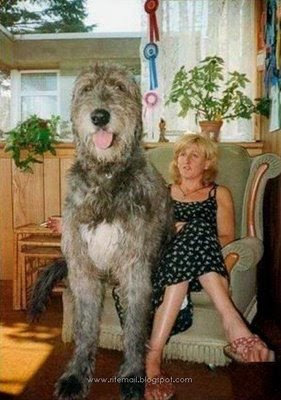 Dog lover if you was really a dog lover, you will shock after see this weird and bizarre picture of the world's biggest dog ever, i don't know whether this is a photo shopped image or is it really original image?? 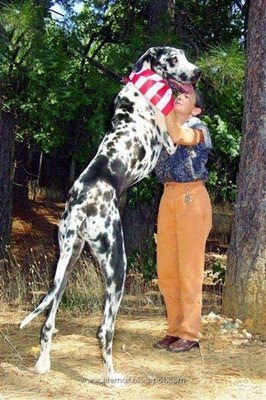 check it out the world biggest dog ever.. 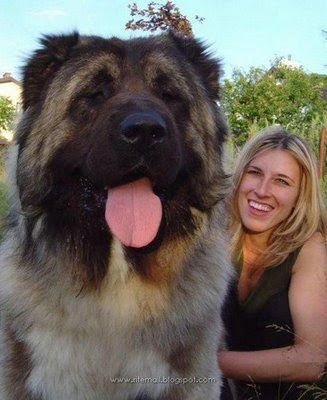 Description: World's Biggest Dog - Is it Real?? Rating: 4.5 Reviewer: Crazy World - ItemReviewed: World's Biggest Dog - Is it Real?? they are real, i have seen one. All of these are fakes. The Biggest dog In the world is a Great Dane named Titan. i can't bear the last picture. 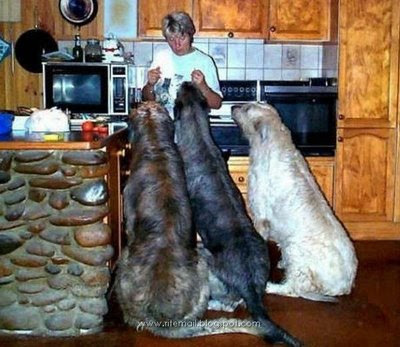 it seems to be really scary to have 3 giant dogs inside your house. 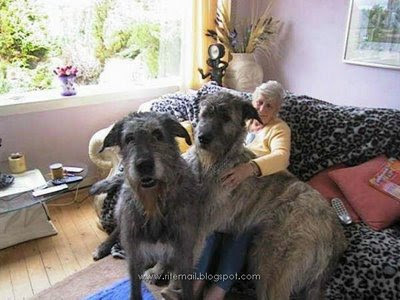 Most of these are real Irish wolf hounds get really big and that is what some of them ar and some of them are great danes and they get really really big I know I own One. But some of them may be fake or the dogs are just really over wheight. I could see that! I have a Great Dane and she is HUGE!! Not quite this big but she is a BIG Female!! She Towers above me and my husband who is 6 ft tall!! I LOVE HUGE dogs! !So I could totally see these as REAL!! I have seen some pretty big dogs too!! ANd WHO cares what the smallest dog is!! If were lookin at pictures of BIG dogs obviously people are INTERESTED in the BIG dog and not the smallest dog!! Small dogs should be exterminated like rats and roaches!! BLAH!!! I'm fine with either smALL OR huGE ONES. For as long as it carries my burden with giggles. They are all real.. I can see Irish wolfhounds, a Tibetan Mastiff and Great Danes. But yeah, they are all huge dogs. 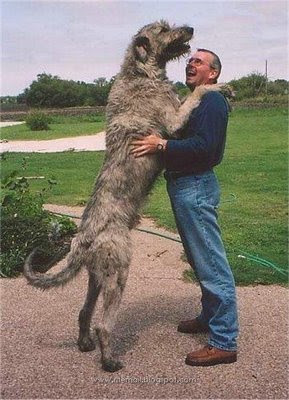 My neighbour used to have an Irish Wolfhound and it was a HUGE dog, about the size of a pony. The biggest dog in recorded history was an English Mastiff. i can barly sand it when my 60 pound dog sits on me cant believe what that lady thinking hahahaha!!!!!!!! There are NO PIX of Newfoundland Dogs. We have a runt of the litter named Sorcha Joy and she is 100 pds. Being a 'brown' she has lots of attitude and does think she is a lap dog. We discourage her from jumping up but when she does put her paws on my husband's shoulders [he's 6'2"] they are of equal height. Just LOVE those 'newfs'. these are not fake!!!!!!!!!!!!!!! 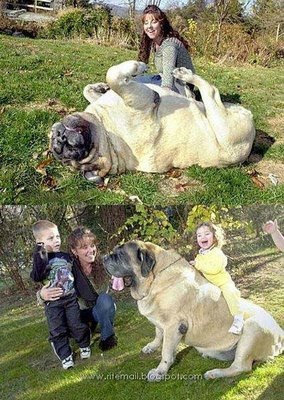 and for the losers who think they are my dog is 250 pounds and he is an english mastiff! Your all wrong. 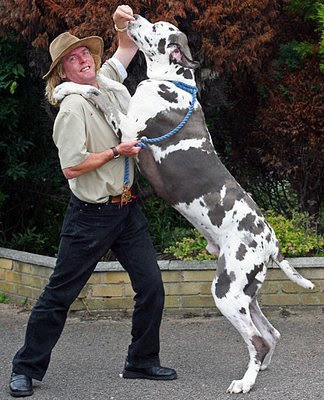 the largest dog in the world is George, a grey great dane.